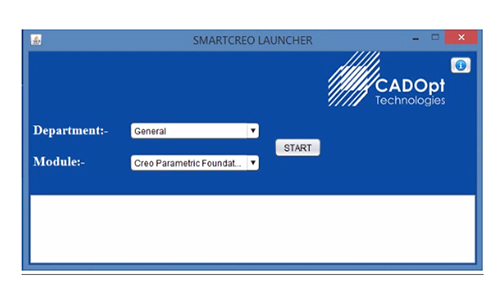 SmartCreoLauncher is a standalone application which will automate Creo Launch, apply appropriate Settings like Module, Standards, library setting, Drawing setting, etc… This application will take all necessary details / information from server & also not required any installation in the client machine. User need to manually determine and configure the required settings / standards for Creo. Each time, User have to locate the Libraries of standard parts, symbols, textures, materials, UDF standards. By Manually, User need to specify Module/App specific settings & environment settings. Time will consume for User to manually determine and configure the required settings / standards for Creo. If there is any change in Creo settings, need to change Creo settings in all user machines. While configuring Creo settings, there may be chance of Manual error while configuring. There may be different configuration file backup and configuration settings among the user. Speed – One click solution to propagate the necessary details. Error Free – Eliminates user setting errors. Enhanced User Productivity - Eliminate Designer/Creo User’s non-productive (manual settings) activities, saving significant time. Standardization – Standardization of Process as per company standards and maintains uniformity across the engineering functions. Simplify tasks – Easy to maintain Creo standards in server. Productivity - Completely configured application including start parts and libraries for productivity. One-click solution that automatically determines and configure the required settings / standards for Creo. Easy of Administration - Any Changes/Updates will be deployed easily on server. Configures Libraries of standard parts, symbols, textures, materials, UDFs standards. Attribute manager for adding parameters.